Thank you all so much for your sweet comments on yesterday’s post! I really appreciated each and every one, and I was heartened to learn that so many of you went through a similar trajectory. We’ve got more adventures coming our way: Eric’s dad arrives today (woohoo! ), and we’re heading back down to Palomar and San Diego for Big Fun, Round Two. Before we hit the road, here are a few little fun things I’ve been doing around the house lately. They really need to be prefaced by a little discussion of Michael’s. You know, the craft store. And wonderland of cheap fun things! I joke with my friend Hillary about its siren song, but it’s not really a joke after all. The siren song arrives via email and an app on my phone, and also the million times I drive by the store on a regular basis. They have baskets full of so-cheap-it’s-almost-free stuff right out front, to catch the eye of intrepid magpies like myself. Every now and again they have a big clearance, and I spend $10 and have way more than $10 worth of fun. 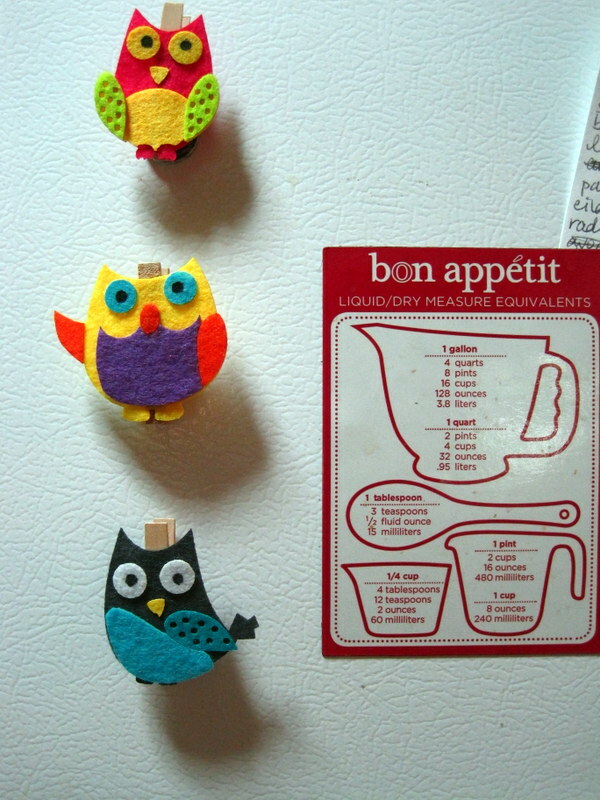 I squealed with glee when I saw that these little owl clips were marked down to 50 cents (for a pack of 6). I had seen them before, but was unwilling to pay $1.99 or whatever other obviously exorbitant price was attached to them. 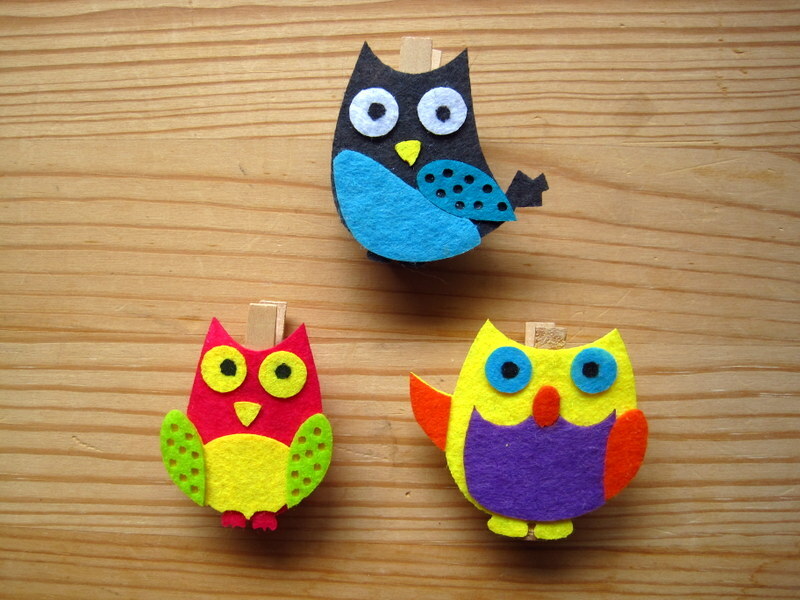 Yay owls! I think we’ll use some of them for chip clips or to make a little line with hangers for various art projects in progress, but for now I turned a few into refrigerator magnets. You know those magnets that are (allegedly) supposed to keep your shower curtain liner from flying all over the place when you take a shower? I had some of those leftover from our ex-shower curtain liner (rest in peace), so I glued them onto the backs of the clips. Voila, insta-magnets! I also found these little treasures. 50 cents! There are some limitations to decorating while renting, but mostly they don’t bother me too much. I make up for not being able to paint by plastering the walls with all kinds of brightly colored things. 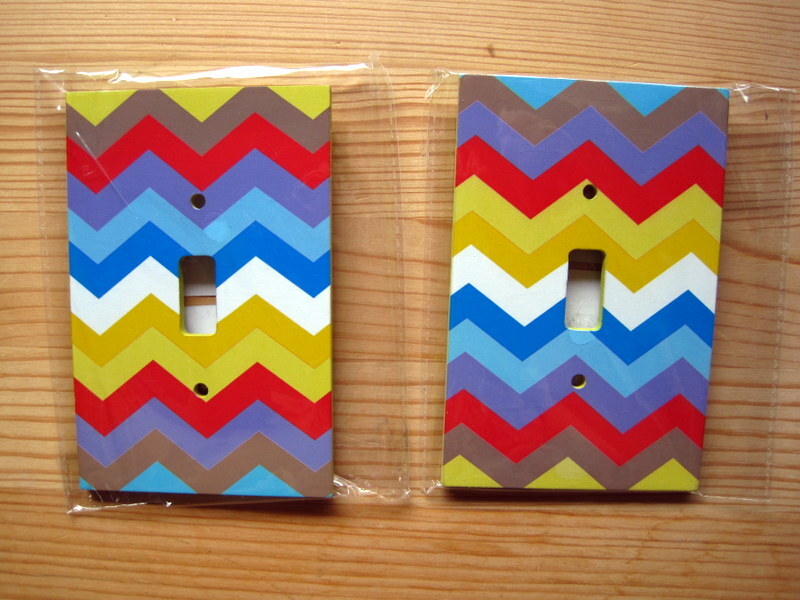 I loved the color palette of these light switch covers, so I bought all of the ones they had. It cost me $4. 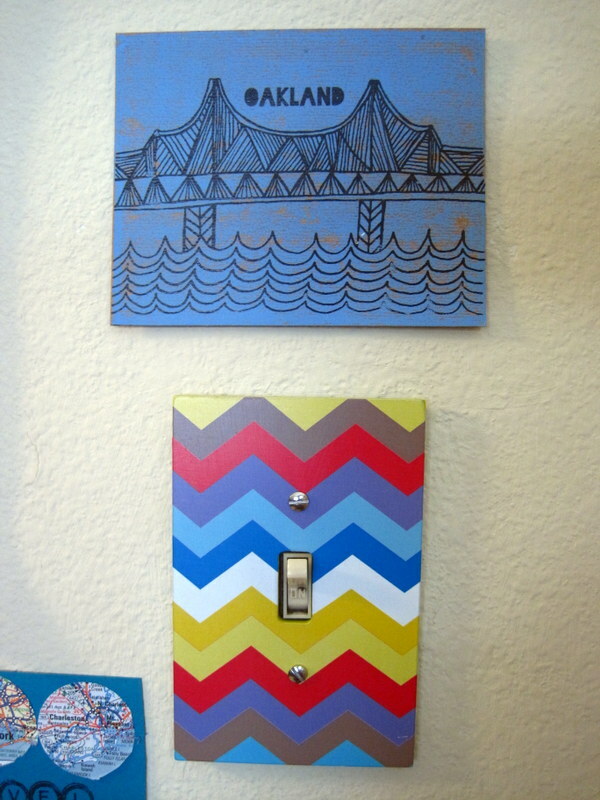 On Sunday I went around the house replacing bland plastic things with happy chevrons. I am already in love with them. Tell me all about your cheap decorating triumphs too! There’s no such thing as too much inspiration. The switch covers are really attractive. I should get some. This professor doesn’t do too much decorating though. I feel like a celebrity is smiling down upon me from Mt. Krug every time I see my name on your blog. I’m smiling to myself about it over here on Mt. Humble Pie. This made me laugh so hard! I had my share of feeling like a celebrity was smiling down on me from Mt. Humble Pie too! I know, I am a sucker for sale things, and I know it’s bad when I don’t even bother trying to add things up in my head before I hit the register. But sometimes that’s the most fun anyway! Looking forward to seeing you and making stuff with you soon! So, here’s my cheap decorating triumph–it is also a wedding score! triumph. DH and I paid for our wedding ourselves, so we had to make every dollar count. The search for centerpieces for the reception tables was nothing short of agonizing, until I stumbled across…the bargain bins at Michael’s! I found these ivory-colored cards with a golden embossed R on the front, blank on the inside, 50 cents for a package of 8. I was struck by their simplicity and elegance, but didn’t know what I would do with them–I already had Thank You cards…and then, I saw, in another bargain bin, gold paint markers. $3 for a package of 5. Viola! For $8.50, I got three packages of cards and two packages of markers, and we put a card on each table with a paint marker. BOOYAH! By the end of the reception, we had cards with well-wishes written inside of them, along with funny recollections and stories! That may well have been one of my cleverer moments in life. Oh, that is so awesome! And what a great idea to have guests write in them! Can’t wait to see pics when you get them up on G+. We went a totally cheapo route for table markers too, despite the protests of some who wanted us to name the tables after astronomers and Russian writers. I was all about keeping it simple, stupid (me, not you), so I chose my sanity over that, but I’d like to think (and hope!) that our personalities came out in other ways at our wedding!